This handy reference transitions from class to clinical to practice to provide the perioperative information needed in hospital operating rooms, ambulatory surgical units, critical care units, procedure labs, and free-standing surgical centers. 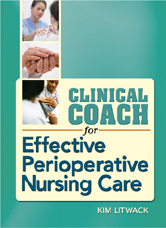 It delivers everything nurses need to know to safely prepare patients for surgical procedures and monitor and care for them afterward. Prioritized bulleted lists, full-color illustrations, and concise tables provide access to essential, evidence-based knowledge.